Campsite Christophorus is a campsite with 150 touring pitches and 450 year round pitches. 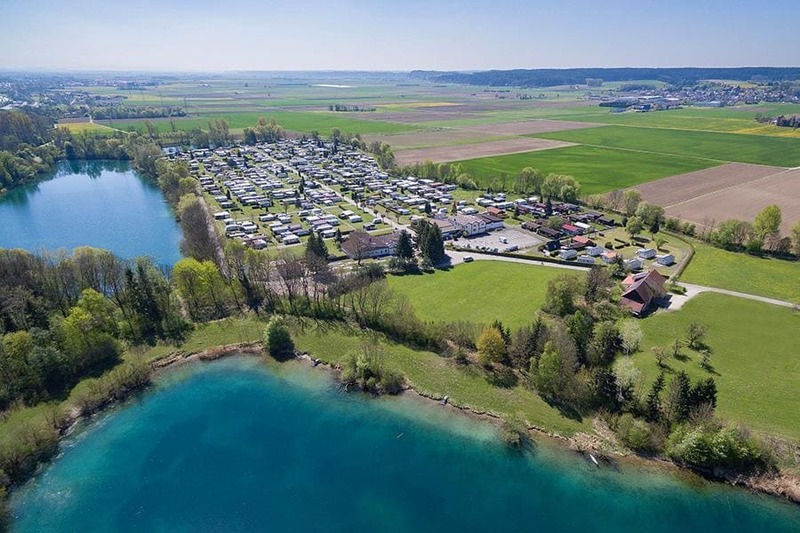 During low season, between 01-01-2019 - 30-06-2019 and 01-09-2019 - 31-12-2019, the nightly rate is €20,- at one of the 150 touring pitches at Campsite Christophorus in Kirchberg an der Iller (Baden-Württemberg). At this campsite you can not only use your CampingCard ACSI for inexpensive camping, you can also use your ACSI Club ID (as an alternative ID). A beautifully situated campsite with three lovely lakes. Ideal for families. New playground with badminton/volleyball field, barbecue, located directly on the Iller cycle path, excellent, new and modern restaurant, quiet location. Stop over site on route to Northern Italy. Many statics with some space for tourers. Site staff friendly and helpful but not used to needs of caravanners. Pitch was allocated but one with a considerable slope away from the road. Difficult for a caravan but impossible for a motorcaravan unless you carry a lot of levelling blocks. Staff changed my place straight away and I think understood why, given I was working in another language. Toilet facilities first class. Restaurant closes every Monday throughout the season. Site is advertised as disabled friendly but we found problems in 3 areas. Steps up to the main reception are open without a hand rail. The restaurant has no disabled wheelchair ramp, and the barrier system has to be operated by an electronic key which we couldn\'t reach from inside our motorhome. Having said this the staff were as helpful as they could have been given the circumstances. Good toilets etc although not the best we have been in. Ridiculous time to close the site to entrants 12:00 until 14:00. Good for overnight stop.not sure where the carry out meals are from. Decent restaurant. Have to pay for the swimming pool. The reception was friendly and helpful, though only staying overnight we were allocated an excellent pitch. The facilities, toilets and showers were of a high standard. Site chosen due to the very easy access from the A7 motorway en route home from Italy. There was a warm welcome from the English speaking receptionist and we were allocated a good size pitch within 50 metres of the entrance. The facilities here are some of the best we have seen and we made a point of going into the reception when we left to thank the staff and comment on the very high standards. We decided to eat at the on site restaurant which is at the entrance and is clearly used by people who are not staying on the site so it is not dependent upon their using it to maintain a very good standard. The meal that we had was one of the best in over 4 weeks away and the quality of the wine was excellent. The restaurant staff spoke minimal English and there was no menu in English. There are a large number of seasonal pitches but the touring area seems to be directly off the main access road and is very well placed for the facilities and restaurant. Would recommend highly for an overnight stay. Stayed overnight on way to Italy. Warm welcome, excellent facilities, lovely clean site. Would definately stay again. Stayed here for an overnight stop en route to Italy. Easy to find, very friendly and helpful staff, lovely clean facilities and site. Would definately stay again. Would you like to book Campsite Christophorus or request more information? You can do both using the information below. Leave the A7 Ulm-Memmingen at exit 125. In Altenstadt drive towards Kirchberg. Follow the signs before Kirchberg. CampingCard ACSI will send your information request to "Campsite Christophorus".